Resume writer? Career coach? Career professional? In support of the 2018 Career Innovator Award competition, I’ve put together a 9 minute video on how you can cultivate innovation as a career industry professional. Innovation is the life blood for our industry and impacts how we improve the success and satisfaction of those we serve. To understand this, we need look no further than the integration of the visual graphic resume into our field. If we had continued to only write the black and white typewritten resumes of the 1990s our industry would likely have died out. Our clients simply wouldn’t have need for us if we couldn’t help them differentiate themselves in the crowded global marketplace that exists today. It started with someone, likely with graphic design skills, bringing their talents into the resume writing industry and seeing the intersection in job seeker marketing. That individual would have been able to buck the rules and try something different. And it worked. It was truly innovative. It wasn’t loved at first, and some still fight it. But when I look at how online job search has evovled, I realize this evolution was critical to our showing our ability to be relevant. Also, something that most disliked and ignored initially has become the norm in the industry! Even without graphic resumes, we have had to respond to industry innovations to survive. Think about how we first wrote for decision makers. Then we wrote for HR clerks. Then we wrote for systems with scannable documents and keywords. Now we must write for ATS. Likewise, those of us who coach have had to learn about the whole online job market, hidden jobs, social search, and brand management. Most recently we’re seeing the emergence of artificial intelligence in recruiting, changing the game again. Innovation is all around us all the time, and we can be a part of it! So what happens when you want to cultivate innovation but don’t know where to start? Understand and overcome the fact that being in the industry already is both a blessing and a curse. Get started when you have no ideas. Use SWOT analysis to evaluate what you offer, what exists, and what is needed. Take a sticky pad and use it as a launch pad to see your areas of expertise, the gaps, and the opportunities. Consider what is taking place elsewhere to look for intersections and possibilities. Look toward your customers and social media to get the answers you need. Recognize that collaboration can make the impossible possible. I also touch on the importance of making time to get started. It’s impossible to move something off the back burner if you don’t prioritize it! After making this video this morning I worked with a few of my private clients. One of them was sharing a common confusion her clients suffer and how she has to spend time educating them so they understand the service they need. Listening to client challenges and needs is one of the ways to identify opportunities for innovation, so a lightbulb went off for a new product idea. We were very excited because she will now be able to be proactive in response, save time, and create a new service and accompanying marketing campaign for existing clients. That’s what I call innovation, and it can happen at any time when you are open and looking for it! It’s time to look for those opportunities. Remember, the video is only 9 minutes long but could be the launchpad you need to your next product, service, or Career Innovator Award! 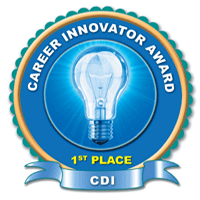 Are you a Career Innovator?